All the foam-related news that is fit to print! Thanks to Awesomely Nerf and one of his fans, we have some interesting news about the FireStrike design. That little tab on the bottom of the handle actually has a purpose. It was originally designed to help prime another FireStrike in your opposite hand. A few moments later someone mentioned design similarities on the StrongArm as well. It appears that these blasters were designed to be dual-wielded from the start. Now, I’m not sure about the FireStrikes, but after borrowing a second StrongArm for a moment, I must say; dual-wielding StrongArms is pretty sick. You get two extra rounds before reloading compared to the HammerShot and/or Sweet Revenge’s version of two-blaster mojo. If you have the opportunity, you should definitely try any of these options out (including a StrongArm/FireStrike combo,) and see how well they work for you. You may be pleasantly surprised. It is very unlikely that I will ever do a comprehensive range test comparison complete with charts and color-coded graphs. So, instead I will rely on the efforts of my fellow bloggers. Thanks to UrbanIso, here is a pretty comprehensive list of stock blaster ranges. But this time with an image to back it up. Thanks to the more established Nerf bloggers out there (links below) the news of this Mega blaster pistol is starting to pick up. A foam blaster-centric store out of Germany named Bankcroft has posted a not-yet-for-sale page for this yet-to-be-released blaster. 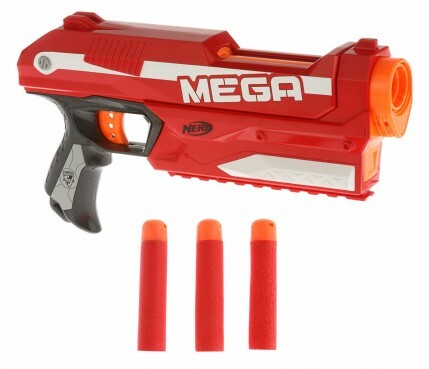 So, I checked out the page, and with a little help from Google Translate, it appears that none of the information has really changed: It’s a single shot blaster with a built-in clip to hold a three Mega dart payload, with Mega dart ranges, and it’s over a foot long. We have been given some new information though: The blaster will have a similar priming mechanism as the old Nerf Scout IX-3, it will have a tactical rail along the bottom, and the styling is very similar to the Centurion. There is still some question as to price when it comes to the States, but we’ll let you know when we have that nailed down. I am excited about this blaster, but I still have my concerns. I hope that Nerf has ironed out the mechanical issues of the Mega line before finalizing this beast of a blaster pistol. All over the internet there are articles about whether “fun” in the workplace is a help or a hindrance. I really think that it has to be decided on a case-by-case basis. I worked as a contract draftsman for over a decade before joining the company that I’m at now. There were a few companies that could have benefited from the morale boost of the occasional Nerf War. Although, I believe that most of the places that I worked at during that time would not have benefited in any way from such activities. If you are already working in a Nerf-friendly atmosphere, and it’s working well for your company, that’s awesome! I encourage you to embrace it, and enjoy it to the fullest. As I was blessed to have joined a company with a pre-existing Nerf culture, I have no words of advice to help you integrate Nerf into your office culture if it doesn’t already exist, but if I happen across a useful article, like the following, I will definitely pass it on. I happened across this article on the UrbanIso blog suggesting some hints on how to introduce Nerf to your office. It was a really good read. Check it out!